Global robot demand will rise 10.5 percent annually through 2016 to $20.2 billion. Five countries -- the US, Japan, Germany, China, and South Korea -- will continue to dominate demand, with the US remaining the largest national market. Smaller, less expensive service robots will outpace more sophisticated, high-value industrial and medical robots. 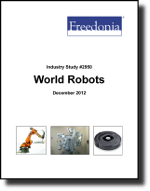 This study analyzes the $12.3 billion world robot industry. It presents historical demand data for the years 2001, 2006 and 2011, and forecasts for 2016 and 2021 by type (industrial, service), market (e.g., motor vehicles, chemicals, electrical/electronic products, professional services, personal services), world region and for 14 countries. The study also considers market environment variables, details industry structure, evaluates company market share and profiles 44 industry players, including ABB, FANUC, and Yaskawa Electric.